We’ve said it before and we’ll say it again: Your brand is not your logo. And when sales are down, a new logo isn’t going to trigger a flood of new customers. Instead, that’s up to you and the quality of the products or services you deliver. But that doesn’t mean that logos are worthless. In fact, they’re incredibly important. Logos are a visual trigger consumers can use to quickly and reliably identify a product, so when it’s time to refresh a logo to keep it current, it’s a challenging balance of maintenance and innovation. The secret is subtlety. This was the case with the recent updating of Larry, the Quaker Oats mascot man. 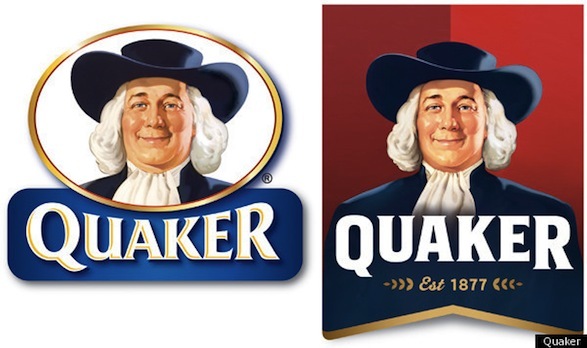 In fact, Hornall Anderson (Quaker’s brand-design firm) wanted the logo change to be so discreet that no one would even notice. Designers gave Larry a minor haircut, removed his double chin, and smoothed out some of the plumpness of his face. Larry still has his crow’s feet and a sparkle in his eye – the qualities that make him seem like a jolly old man and someone you’d trust to make a good oatmeal recommendation. The date has been incorporated into the bottom of the logo, which reinforces Quaker’s experience and quality. And lastly, the two shades of red in the background give a new sense of energy and movement. The subtle changes may seem unsubstantial, but they’re all specifically designed to keep Quaker relevant to a new generation of consumers while still highlighting the most important elements of the Quaker brand. That’s the thing about design… It’s not enough to make something look good. There has to be meaning built in, as well. Even the decision to make a brand change sends a message. For Quaker, that message is that they want the next generation as customers as well. Every element of that change was calculated to support that goal – from the decision to update their logo, to the colors they chose, to the haircut. And that’s how it should be for anyone making a strategic brand decision. Does your website support your vision? Does your logo reinforce your brand? Are your changes calculated? Or are you just bored with what you have?